In a large, heavy saucepan, melt 2 tablespoons of the butter over medium heat. Add the onion and saffron and cook, stirring frequently until tender, about 3 minutes. Add the rice and stir to coat with the butter. Add the wine and simmer until most of the liquid has evaporated, about 1 minute. Add 1/2 cup hot broth and stir until almost completely absorbed, about 2 minutes. Continue cooking the rice, adding the broth, 1/2 cup at a time, stirring constantly and allowing each addition of the broth to absorb before adding the next. Cook the rice until tender but still firm to the bite and the mixture is creamy, about 20 minutes. Remove the pan from the heat and stir in the remaining butter, Parmesan cheese, salt, and pepper. Use 3 shallow bowls- place flour in one, eggs in another, and bread crumbs in the other. 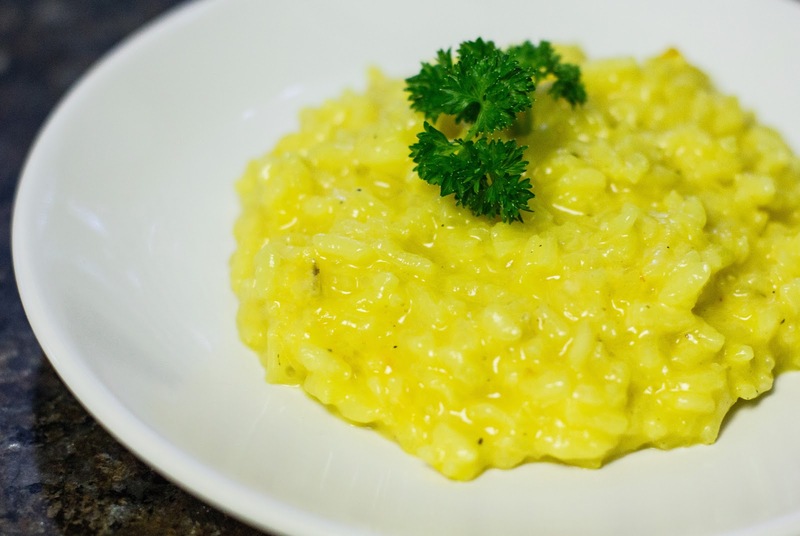 Take the risotto and form into balls about an inch and half in diameter. Press a chunk of mozzarella into the center and close up the ball around it. 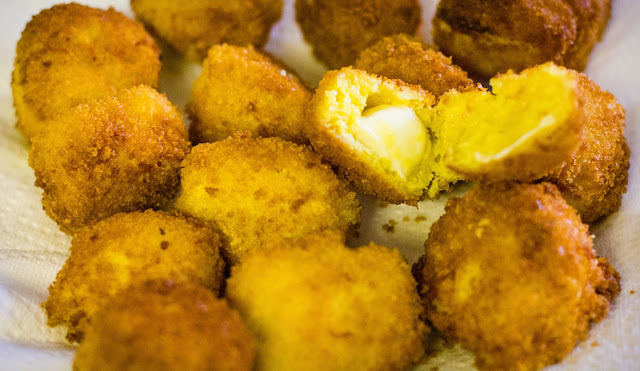 Roll the balls in the flour, then in the egg, then coat in breadcrumbs. Heat oil in a deep skillet and fry the rice balls until golden brown. Drain on a paper towel, and cool to room temperature before serving. When we think of raw fish, Asian flavors often come to mind. But when I had the opportunity to try dill pollen from Marx Foods, the first thing I thought of was the traditional Norwegian flavors of dill with salmon and cucumbers. To showcase the pollen's intense flavor, leaving things raw seemed like the best option. Indeed, rich salmon and crunchy cucumber go together perfectly, especially with the earthiness of dill pollen. This is a light and refreshing dish that could be enjoyed as an appetizer or amuse bouche. First, prepare the cucumber cups. Peel, then cut off the rounded ends. Slice into 1 1/2-inch rounds. If you have a melon baller, use it to scoop out most of the seeds from one side of a cucumber round. Leave enough at the bottom to hold the salmon mixture. If you don't have a melon baller, use a small sharp knife to carefully cut a ridge around the seeds of each round. Only cut on one side and don't go all the way through. Scoop out the seeds with a spoon. In a medium bowl, mix the lemon juice, shallot, salt, pepper, and 1/2 teaspoon dill pollen. Fold the diced salmon into the lemon juice mixture, blending well. 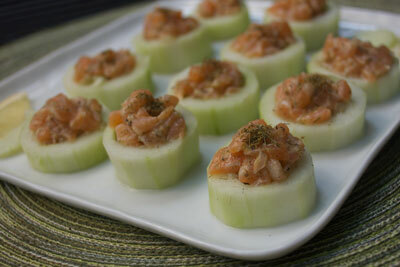 Assemble by scooping the diced salmon into the cucumber cups. Garnish with remaining dill pollen. Place the mushrooms and boiling water into a medium bowl. Place a small bowl atop mushrooms to keep submerged. Let sit for 20 minutes. Drain and coarsely chop the mushrooms. Melt the butter with oil in a medium skillet over medium heat. Add the mushrooms and saute until they begin to brown. Sprinkle with salt & pepper. Remove from the heat. Whisk 1/4 cup Parmesan, mascarpone, whipping cream, garlic and nutmeg together; season with salt and pepper. Preheat oven to 325F. Butter a wide shallow 2 quart baking dish. Arrange 1/4 of the potato slices on the bottom of the dish. Sprinkle lightly with salt and pepper. Scatter 1/4 of the mushrooms over. Repeat potato slices and mushrooms. Spread half of the cheese mixture over. Repeat with remaining potatoes and mushrooms in two layers each. Top with the remaining cheese mixture. Sprinkle remaining 2 tablespoons of Parmesan cheese over the top. Place the gratin dish on a baking sheet and bake uncovered until the top is brown and the sauce is bubbling; about 1 1/4 hours. Let stand 15 minutes before serving. Preheat the oven to 350 degrees F (175 degrees C). Spray a 9x13 inch baking dish with cooking spray. In a bowl, beat the cream cheese with the vanilla bean seeds and 1 cup of sugar until smooth. Soak the saffron in hot water. Let sit until the water is cool. Drain and reserve the liquid. Mix together the honey, melted butter, eggs and saffron water. In a large bowl, stir together the flour, cardamom, lemon zest and salt. Add the yeast and saffron mixture. Stir well. Turn out onto a floured surface and knead for 20 minutes, gradually adding up to 1/4 cup water (add in increments of a teaspoon), until the dough is smooth and elastic. Put the dough in a lightly oiled bowl, cover with cling wrap and let rise in a warm place for 1 hour. Punch down the dough and allow to rise for another 30 minutes. 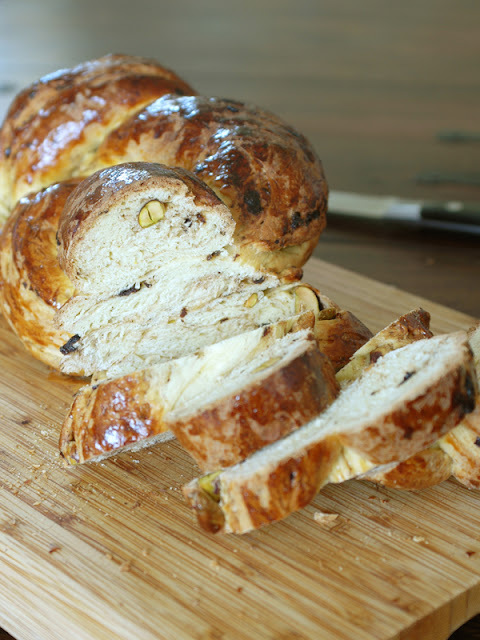 Knead in the currants and pistachios, then split the dough into 4 equally sized pieces and roll each into a long strand. Create a four-strand braid by pinching one end of the strands together, then crossing strand 4 over strand 2, strand 1 over strand 3, strand 2 over strand 3 (repeat until you reach the end, then pinch the ends together and tuck underneath). 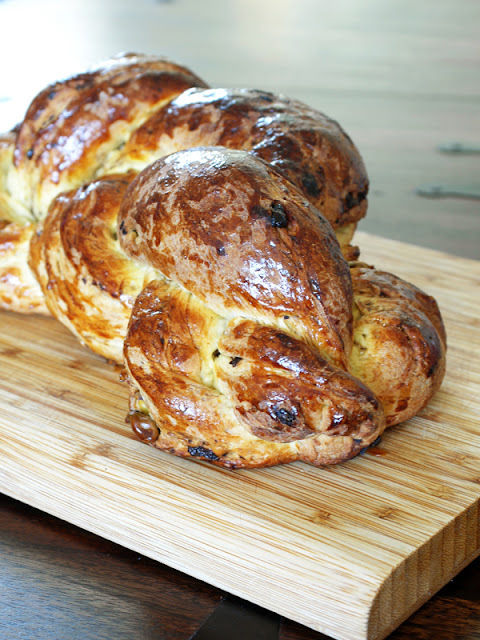 Place on a parchment-covered baking sheet. Whisk the egg yolk and cold water together with a fork, then brush over the loaf. Let rise for another hour. Brush the loaf with another layer of egg wash, then bake for 30 minutes. Combine all ingredients (including the vanilla pod) in a 1- quart container with a tight lid. Shake until the sugar is dissolved. Chill for at least 1 hour. Remove the pod, pour the mixture into an ice cream maker, and freeze in accordance with manufacturer's instructions. I used a single serve ice cream maker. Fruit, Candy, Cookies, Nuts. I like to chop dark chocolate chips and add to the ice cream after the first 5 minutes. Cream together the butter and sugar until light and fluffy. Beat in the eggs, one at a time, until fully incorporated. Add the vanilla extract. Sift the flour with baking soda. Add to the creamed mixture, 1/3 at a time, alternately with the ricotta and chopped nuts. Drop by rounded teaspoon onto a baking sheet and bake for 14 minutes, or until golden brown on bottoms. In a mixing bowl, combine the sugar with milk until you get it to a nice pour-able consistency. If it is too thick, add a bit more milk. Add the vanilla seeds and mix well. 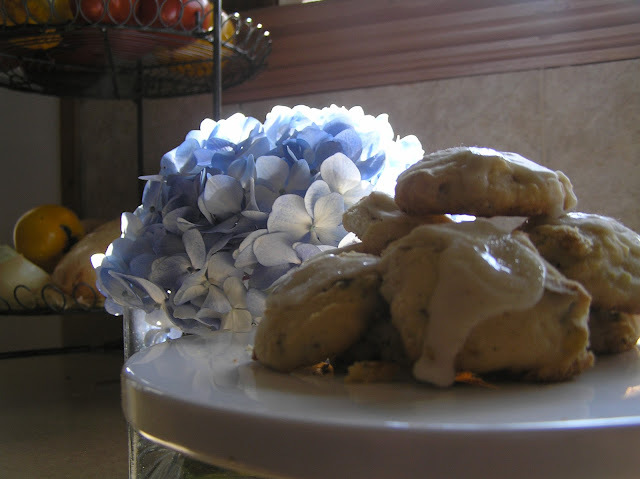 Using a spoon, drizzle the glaze over the cooled cookies. This recipe will yield anywhere from 10 to 12 dozen cookies, depending on how big you make them, I like them on the small side (bite size), so I usually get 150 cookies from this batch. I am not really sure where this recipe originated. It is a staple in my house and I make it from memory. I did adapt it to be a lighter dish a long time ago. The original recipe called for chicken parts with skin, more oil and more flour. My daughter calls it Yellow Chicken and it is her favorite. She loves the way the red saffron turns everything in the dish yellow. What she doesn't realize is that the saffron gives this dish a lovely buttery mellow flavor. I hope you enjoy this as much as my family does. In a large skillet, lightly brown the chicken with 1 tablespoon of canola oil. Remove from the skillet and set aside in a dish. Add the onion, fennel and garlic to the pan and saute with the remaining 1 tablespoon of canola oil until the fennel is softened, for about 5 minutes. Return the chicken and accumulated juices back to the pan. Add the broth, olives and saffron to the pan and bring to a boil. 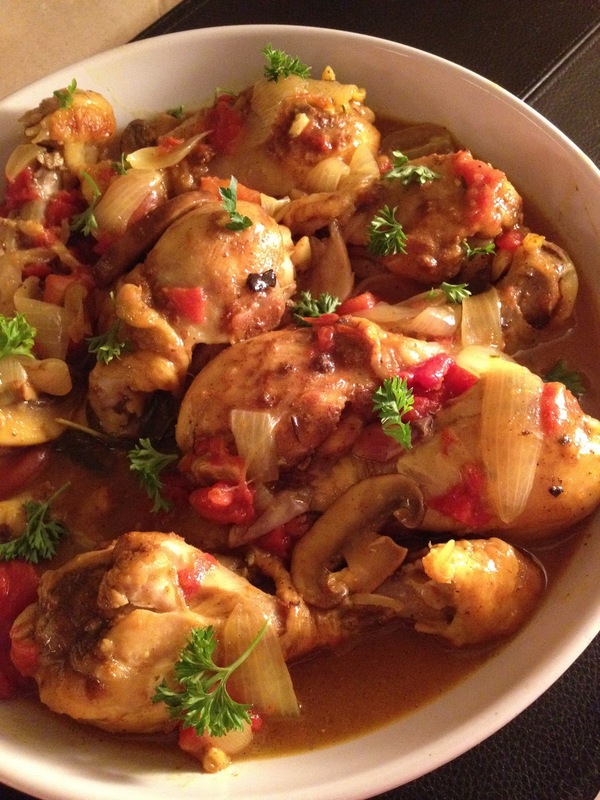 Reduce the heat and simmer for about 20 to 25 minutes, until the chicken is cooked. While still simmering, remove about ½ cup of the liquid from the pan. Add the flour to the liquid you removed and stir with a fork until the flour is dissolved. Return the liquid/flour mixture to the pan and simmer for about 5 more minutes, until slightly thickened. Remove from the heat and stir in the lemon juice. Serve over white or brown rice. Enjoy. Toast the guajillo chiles in a dry pan over medium heat for 6-7 minutes, then grind in a spice grinder with allspice, coriander, star anise, and salt. Remove any silver skin (silvery-white membrane) that may be on the underside of the duck breast. Score the skin of the duck in a diamond pattern and pat the duck breasts dry with a paper towel, then rub all over with spice mix. Let sit for about 1/2 hour before cooking. 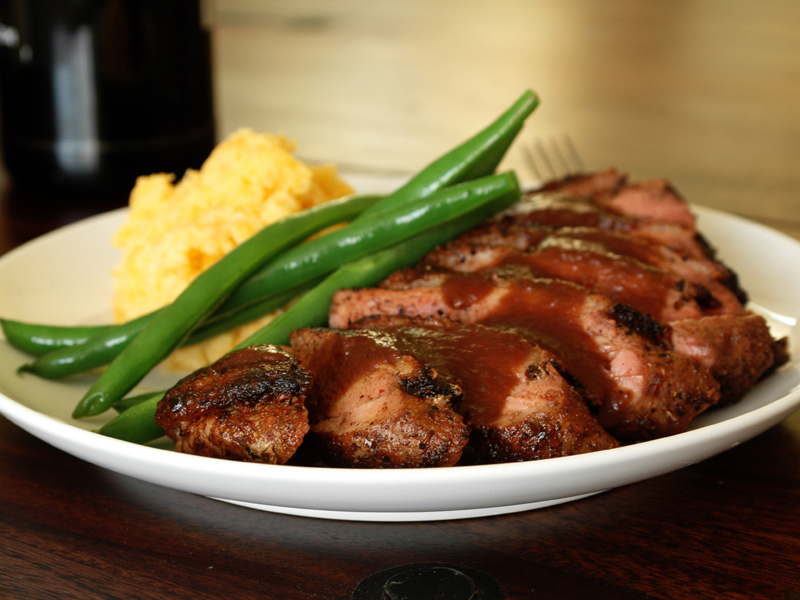 Heat a cast-iron skillet on high for 1 minute, then cook the duck breasts to your desired doneness. Watch carefully so that the skin doesn't get burned. I cooked mine skin side down for 7 minutes, then flipped them over and cooked for 5 min. A great guide for cooking times and basic instruction can be found here. Let rest for 10 minutes before slicing. In a pot, melt 1 tablespoon of butter. Sauté the onions until golden, add 1/2 cup of port, dried cherries and tamarind pulp, simmer until the cherries are soft and the port is slightly reduced. Blend. Return to the pot and add remaining 1/2 cup port, honey, salt and pepper. Bring to a boil, stir in 2 tablespoons of butter, then strain in a fine mesh sieve. Pictured served with green beans and mashed rutabagas. Chuck was a dear friend of mine. He passed away about a year and a half ago and I miss him all the time. I miss a lot of things about him. He loved words. He’d wonder why the pinkie finger is called the pinkie finger. He’d research why we use the abbreviation “lb” for pound. He’d look up the history of sayings like “three sheets to the wind” and “son of a gun” (turns out both come from sailing). He loved phrases like “we must endeavor to persevere”. His favorite word was “indefatigable”. He was freakin hilarious. His foreign accents and impressions were priceless. Ted Kennedy, John Wayne, Sean Connery, The Russian, The Scottish Guy, The New Englander, The German… He’d bust out one of these voices when you least expected it and have everyone doubled over in laughter. We’d beg him sometimes, “come on Chuck, do the Russian, PLEASE!!”. How tall do you weigh? Those are my principles. If you don’t like them, well I have others. 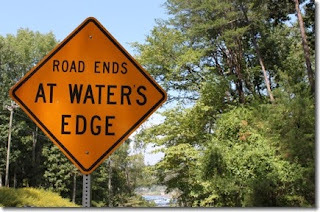 Road ends at water’s edge. Looking back, I think Chuck knew he was sick LONG before he admitted it to himself, and WAY before he grudgingly went to see a doctor. During that time, I think he worked at being happy. One thing he would do was put both his arms up in the air and hold them there. His theory was that you could only stand there for so long with your arms up over your head before you felt like an idiot. You’d eventually start laughing at yourself and feel better. Try it. No seriously, try it. Put your arms straight up over your head and see how long you last before you start laughing. I’ll wait…. Chuck kept a blog. It’s mostly ramblings from his mind. Words he researched. Things he found on the Internet. Things that made him laugh. I’m glad it’s there for me to read whenever I need a dose of Chuck. Check it out. You’ll laugh. I promise. Chuck dubbed this recipe Squeaky Beans because if you cook them just right, they squeak on your teeth when you bite into them. Fresh green beans – I think they look better if you leave them long, but they’re hard to eat that way, so I cut them up. Marx Foods Dried Shiitake Mushrooms, sliced – If the mushrooms are dried, you will need to reconstitute them. Marx Foods has some great info on this, as well as how to convert fresh mushroom quantities to dried, and vice-versa. 1. Bring a large pot of salted water to a boil. Add the green beans and cook for 4-6 minutes. This is the critical step. Keep a close eye on them and taste them a few times. When they are just barely tender, but still crisp, take them out and immediately put them in an ice bath to stop the cooking process. If you overcook them, you’ll miss out on the squeak. 2. Meanwhile, heat some oil or butter in a sauté pan and add the mushrooms. Season with salt and pepper. Cook them until they are tender and have given up their liquid, about 10 minutes, give or take. 3. Add the green beans and a dash or two of soy sauce. Give the pan a few shakes and cook just long enough to heat the green beans. You don’t want to cook them any further, just heat them up. Add some minced garlic and/or sliced shallots to the mushrooms. Omit the mushrooms and add sliced almonds. Substitute the soy sauce for a dash of lemon juice. When I saw the vanilla beans in the box from Marx Foods, I was determined to use them in an unexpected way, i.e., NOT in a dessert! After much contemplation, I realized that these amazingly fragrant, earthy beans could balance a highly spiced, aromatic dish. A curry was a natural choice! I ended up using a combination of mild and hot curry powders, with chicken as the protein. A dash of butter added sweet, smooth, fatty tones, and sprigs of thyme and tarragon added fresh, herbal notes that rounded out the flavor profile (the anise flavor of the tarragon was unexpectedly perfect with the vanilla). 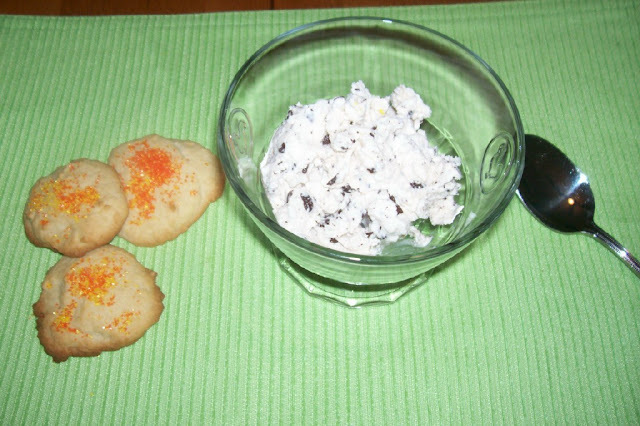 The grapes were a last minute addition, a nod to a favorite curried chicken salad recipe. Combine the vanilla seeds, curry powders, salt and pepper in a small dish. Rub all over the chicken legs. Set aside. Preheat the oven to 325°. Melt the butter in a large Dutch oven over medium heat. Add the chicken legs along with the vanilla bean pieces; cook for fifteen minutes, turning to brown evenly. 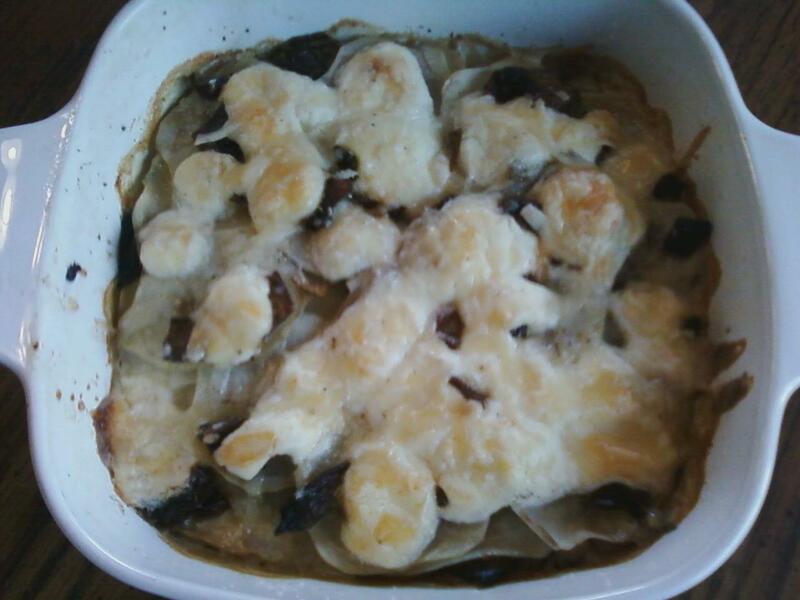 Add the onion and mushrooms; cook for 5 minutes, until softened and slightly browned. Add the tomatoes, chicken stock, herbs, and clove. Bring to a boil; reduce the heat and bake in 325° oven for 1 hour, until the chicken is tender and sauce is reduced slightly. Remove the chicken legs to a platter. De-fat the sauce, remove the clove and thyme sprigs, and check for seasonings. Stir the grapes into the sauce and pour over the chicken. Sprinkle with chopped parsley and serve immediately. My family loves to make pumpkin seeds. I have a yearly adventure -- for the past 20 something years, I have been going pumpkin picking with my friend Tracey and her family. I suggest looking for the sugar pumpkins. One will make enough for a snack or enough to share with someone. The larger pumpkins, don't seem to have many seeds. 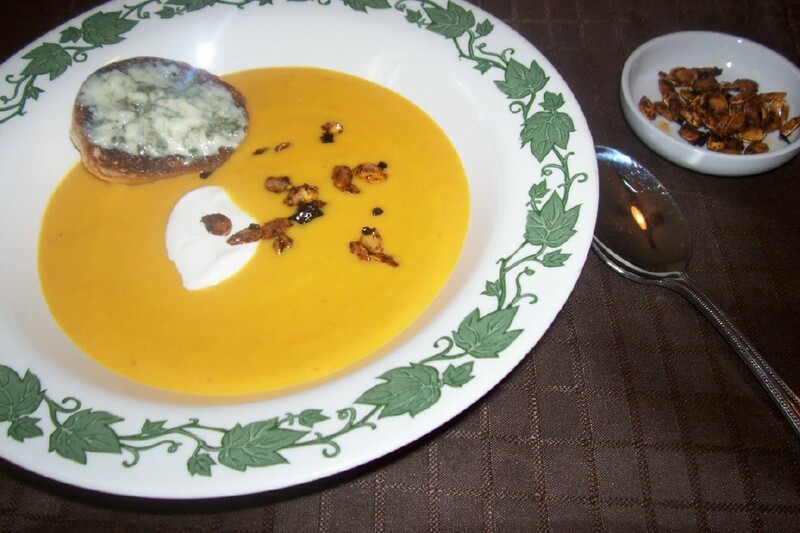 I use the oil from roasting the seeds in Butternut squash soup. Preheat the oven to 375F.Trim the stem end of the New Mexico dried chili pepper and remove the seeds. If you like a bit more heat, feel free to leave them in. Break into pieces, place in a blender and pulse until blended into small pieces. You want it to be more flaky than powdery. 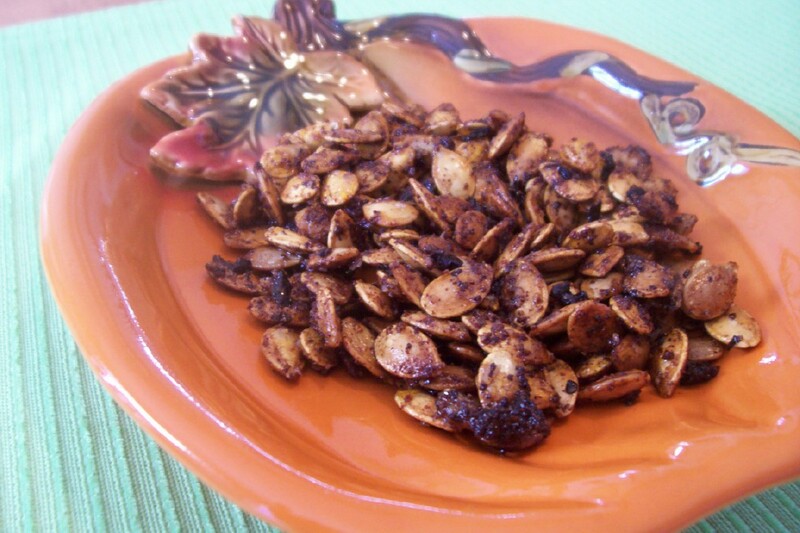 Cut off the top of the pumpkin and scoop out the seeds into a strainer. Rinse under cold water and squish the seeds, this will remove any of the clinging pulp. It's not a problem if small pieces of the pulp remain, it will add some mighty nice flavor. Lay the seeds on a kitchen towel or paper towels to remove most of the water. Don't let them sit too long, they will become sticky. Toss the seeds, oil and spices in a bowl, stir to coat and lay on a shallow baking sheet. Roast for 15 minutes and stir. Check every 5-10 minutes and stir. When golden brown, remove from the oven and let cool. Keep in a baggie or a jar for up to a week or so. Place the vegetables, salt, garlic and stock in a medium pot. Bring to a boil, reduce the heat and simmer, uncovered, for 45 minutes. Remove from the heat and let cool for 10 minutes. Puree with the butter until smooth, in a blender, in 2 or 3 batches. To prevent the liquid from splattering, allow the heat to escape: remove the cap from the hole in the lid and cover the lid with a dish towel when blending. Return the soup back into the pan and reheat. Stir in the cream and the leftover chili oil from the Marx Spicy Roasted Pumpkin Seed recipe, until blended. Garnish with a spoonful of sour cream, and don't forget some crusty bread or perhaps some garlicky toast. Sift the flour and salt together, then stir in the sugar. Heat the butter and water in a large saucepan over low heat until the butter melts. As soon as the butter melts, increase the heat and bring quickly to a full boil. Add in the flour mixture, remove from the heat and stir vigorously. The mixture should form a smooth paste which leaves the sides of the pan clean. Do not beat the paste at this stage or it will become oily. Set aside to cool for about 15 minutes. I like to refrigerate it in a large bowl at this point for about 15 minutes. You don't have to; I have just found it easier to handle portioning it for frying. Heat the milk and saffron gently until just boiling in a medium saucepan. Remove from the heat and cool slightly. Beat the egg yolks with the sugar until pale and thick, then stir in the flour and cornstarch. Gradually stir the milk into the egg and flour mixture. Pour the custard back into the saucepan and heat gently, whisking continuously until the mixture thickens and boils. Boil for 1 minute, stirring continuously. Pour into a large bowl or a shallow dish and cover with plastic wrap. Set aside to cool. Beat until smooth before using. Pour into a pastry bag with a tip and set aside. NOTE: To avoid a lumpy mixture, vigorous mixing is essential throughout cooking. Do not be alarmed if lumps form, just beat hard and they will break up as the custard thickens and comes to a boil. Mix together the sugar and cinnamon in a large bowl. Set aside. Heat a large saucepan with vegetable oil filled up to 2/3 of way full to 350F. 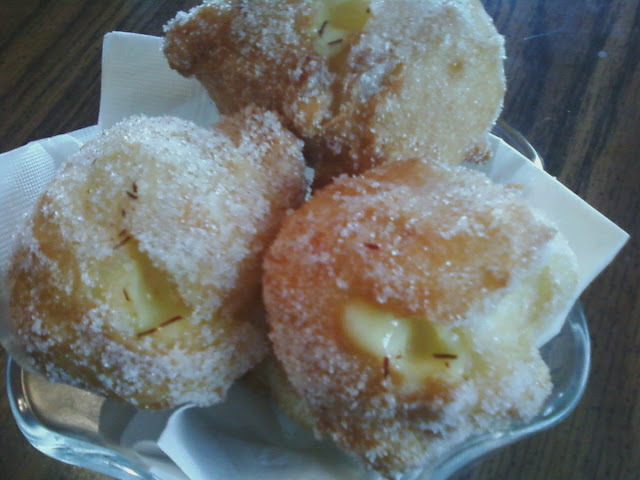 You can also use a deep fryer if you have one. Portion off about 1 tablespoon of choux paste for each benuelo and gently slip into the hot oil. Do not overcrowd them as they will puff up to twice the size. Cook them about 8-10 minutes, gently turning them with a slotted spoon until they have puffed up and become golden brown. With a slotted spoon, take them out of the oil and let the excess oil drain back into the pan. Drop them into the bowl of cinnamon sugar and turn to coat. Poke a hole in them using your pastry bag filled with saffron pastry cream and gently pipe the pastry cream into the benuelo until full. Roll filled pastries gently in cinnamon sugar. Serve warm. The wonderful folks over at Marx Foods kindly sent me some Dried Puya Chilies for our Marx Foods challenge. I opened the bag and inhaled their aroma. Fruity and spicy and such a pretty color--a deep crimson red. What to make? Then it came to me. That’s it, of course! Bread! I love to bake bread. 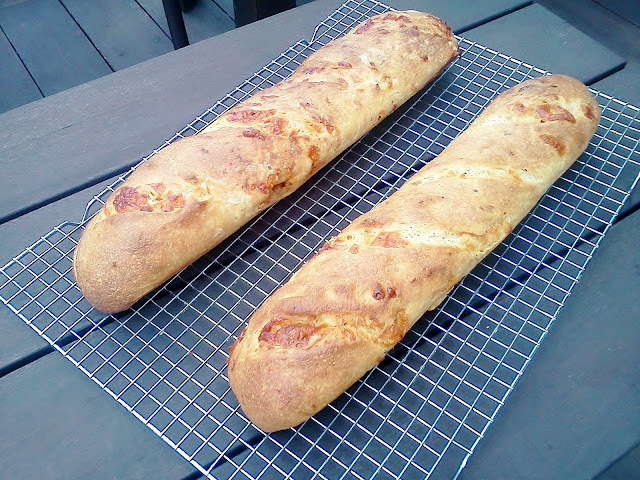 I’ve been baking a lot of breads with cheese of late, and chilies and cheese go so well together, it seemed to be the way to go. Lightly toast the chilies in a dry skillet over medium-low heat until they start to puff slightly. Remove from the heat and cool. Place the chilies in a coffee mill or spice mill and grind to a coarse powder. In a small bowl, mix the chilies with garlic, oregano and ¼ cup of hot water. Let stand for 10 minutes. Place 2 ¼ cups of cool water in the stand mixer bowl. Add the honey and yeast and mix together with a paddle attachment. Add the flour, cornmeal, salt and chili mixture. 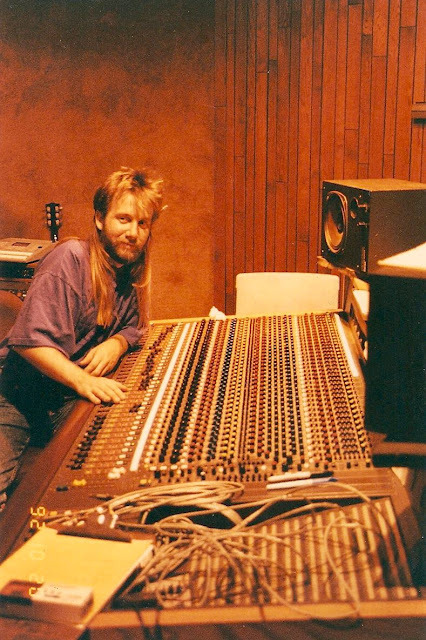 Mix on low speed for 3-4 minutes. Let the dough rest for 10 minutes and then add the olive oil and grated cheeses and mix for 5 minutes on medium speed. Scoop out the dough and place in an oiled 9” x 13” plastic container. I like to use the rectangular container because it makes the next step easier, but you can use a bowl. Cover it tightly. Let the dough rest at room temperature for 30 minutes. You can also watch a video on YouTube of Peter Rheinhart demonstrating the technique (see the bottom of this post). Wait for 15 minutes after the first stretch and fold and then do it again. Repeat. After the third stretch and fold, cover the container tightly and place in the fridge overnight. Remove the dough from the fridge and let it warm up at room temperature for about 15 minutes. Divide the dough in half on a lightly floured surface. Shape into oval logs and place on a peel or a baking sheet dusted with cornmeal, or place the logs in an oiled baguette pan. Slash tops of the loaves diagonally three times with a sharp knife. Cover the loaves with a clean tea towel or paper towels. Let them rise for 30 minutes. Slide the loaves onto the stone or place the baking sheet in the oven. After 5 minutes, turn the oven down to 400 degrees. Bake for 40-45 minutes or until the loaves sound hollow when you thump them. Cool. This bread is excellent for sandwiches, toast or just for snacking on. My co-workers liked it with a bit of veggie cream cheese. You can check out the chilies here! After days of wondering what I was going to make with the dried guajillo chilies sent by Marx Foods, I decided to make my own chili powder and use it in my go-to chili recipe, which I came up with a few years ago after several trial batches. People have their own ideas about what makes real chili...meat, no meat, beans, no beans and on and on. This is my version. My family absolutely loves it, I have taken huge pots of it to family gatherings and come home with no leftovers and I've been asked for my recipe several times. Substituting the guajillo chili powder for the regular stuff from the market gave it a, subtle smokey flavor which I didn't expect but was a nice surprise. I had to track down more guajillo chilies in order to make enough chili powder. The quality of the chilies sent by Marx Foods was so much better than the ones I found at a local market! Preheat oven to 250. Cut off the stem from each chili, then cut down one side to open the chili up so you can remove the seeds. Place the peppers flat on a baking sheet (you'll have to do this in batches), and bake for 10 to 15 minutes (they will smell heavenly as they roast). Remove from the baking sheet and cool completely. I noticed they were still a little pliable when they were still warm, but as they cooled they became crisp...you want them to do this. Meanwhile heat a dry skillet over medium heat, toss in the coriander seeds and toast for a few minutes. Place cooled chili pieces in a food processor or a blender, then add the other ingredients. I recommend processing the coriander seeds in a mini food chopper, or using a mortar and pestle or a rolling pin before you put them in the food processor with the guajillos (I learned this the hard way). Pulse the ingredients until they are ground into a powder. Viola! Your own homemade chili powder! Brown the ground beef with the onion and the garlic. Drain well. Add all other ingredients, bring to a boil, then simmer for a couple of hours. Top with finely diced raw onions and your favorite shredded cheese (I like a mix of cheddar and jack). 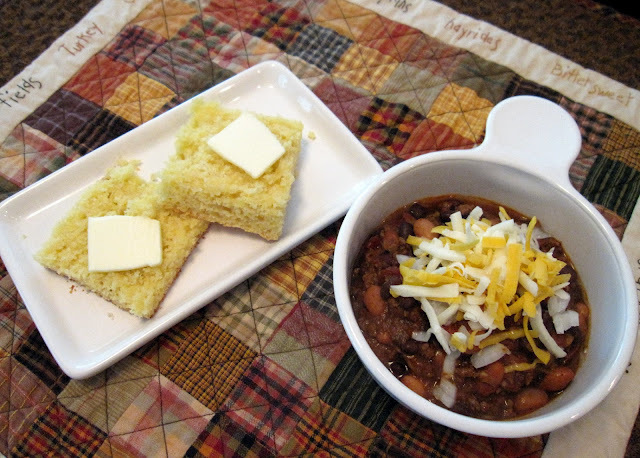 Perfect on a cool fall or cold winter day, and don't forget the cornbread! Making this dish was time consuming and my kitchen was a complete mess, but the reaction from my family made my night! The taste was amazing and I know I'll make this dish again and again, especially in the fall and winter months. Comfort food all the way! Pour the water into a large pot, add the chicken, celery, carrot, onion and bay leaf. Bring to a rapid boil, then simmer uncovered for 1 hour. Remove the chicken and let cool (do not discard the broth). Skim the fat from the broth, strain into a bowl, discard the veggies and bay leaf. Season the strained broth with salt and pepper to taste, add the saffron threads, stir and set aside. When the chicken is cool enough to handle, remove the meat from the bones and cut into bite sized pieces. Set aside. Discard the bones and skin. Melt the butter over medium-high heat, then whisk in the flour, whisking constantly for 5 minutes. Slowly whisk in the 5 cups of chicken broth and stir until the sauce is thick. Season with salt and pepper. Set the sauce aside. Heat the olive oil in a skillet over medium-high heat. Add the carrots, celery and onion. Saute for 8 minutes, add the mushrooms and saute for an additional one to two minutes. Meanwhile, bring some water to a boil in a small saucepan and add the diced potatoes. Boil the potatoes for 5 minutes, drain. Add the sauteed veggies, potatoes, peas, parsley and more salt and pepper to taste, to the sauce. Set aside. Preheat the oven to 400. Roll out one of the crusts to fit into a 9 x 9 inch baking dish, coated with cooking spray. Press the crust into the bottom and up the sides of the dish. 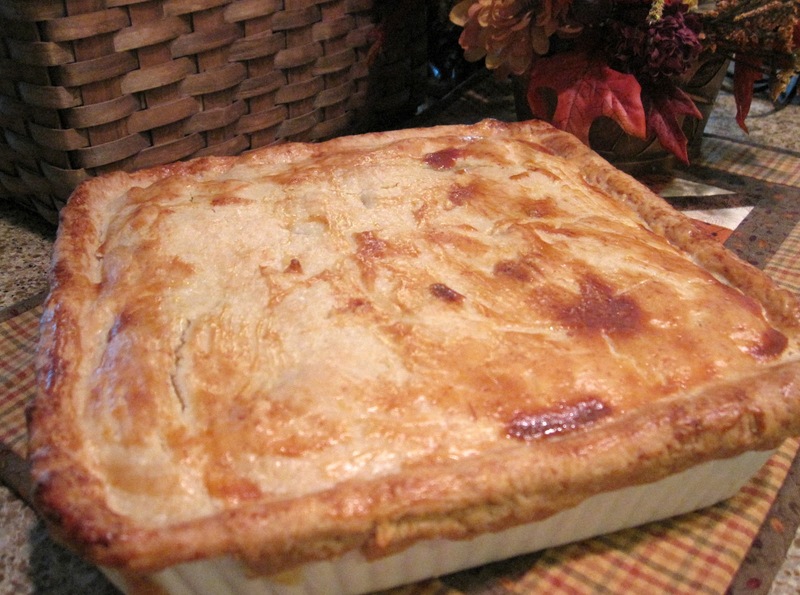 Line the pastry with foil and fill with pie weights or dried beans. Bake for 15 minutes. Remove from the oven and remove the foil and the pie weights. Add the filling to the dish. There will be way more than the 9 x 9 dish will hold (the extra can be frozen for another pot pie later, or it would probably be enough to fill a 9 x 13 dish if you have enough pie crust. I didn't realize how much filling there was going to be as I was creating.). Top the dish with the second pie crust, draping the crust over the sides about 1/2 inch. Trim any excess. Cut 5 slits in the top of the crust. Brush with an egg wash made from one egg beaten with 1 tablespoon of milk. Bake the pot pie at 400 for 15 minutes, turn the oven down to 350 and bake for 45 more minutes, until the crust is golden brown. It goes great with a nice green salad. These are so versatile! You can switch up the cheese and sausage to fit your taste and the contents of your refrigerator. Keep the flavor profile milk so the saffron can shine.But whatever you do, don't skip the cilantro cream! Delicious! Willie thinks these would taste great with some grilled shrimp and I agree! I think a poached egg might turn this into a fabulous breakfast or brunch dish as well. Now, I will say it was very difficult to find the hard chorizo sausage. Luckily, I have a friend here at 37 Cooks, Shannon Tallman, who directed me to Whole Foods. I met the cheese monger at my local Whole Foods and she was so very helpful! I wish I lived closer, I'd bring her one of these wonderful appetizers! 1/2 cup Spanish hard chorizo sausage, small dice, (Call the cheese monger at your local Whole Foods to see if they carry it. This is what mine looked like. Cook the chorizo in a skillet over medium-low or low heat to render all the fat. This can be done while you are making the grits. It does take about 20 minutes or so for all the fat to be rendered. Once done, put the sausage on a few paper towels. Bring the stock, milk, and salt to a boil over medium high heat and then lower the heat to keep a simmer going. Add the saffron threads and let them release their color. This will take about 3-4 minutes. Add the grits and stir. If you use stone ground grits, it will take about 30 minutes for the liquid to be fully absorbed. I didn't and my grits came together in about 5 minutes. Add the chorizo, shredded cheese, butter, and pepper and stir. 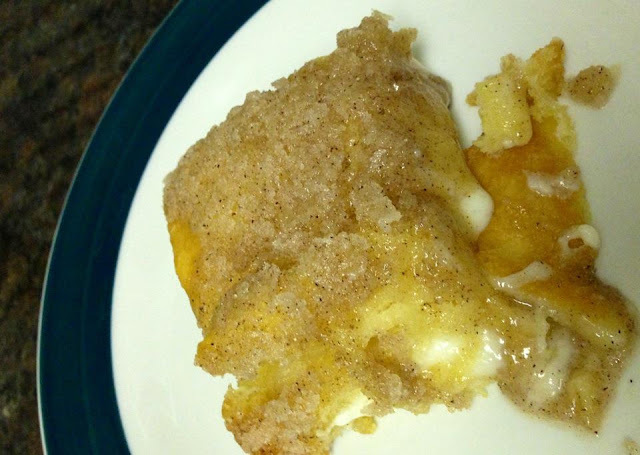 Spoon the grits into a buttered 13x9 baking dish and level and smooth it. Let the grits cool to room temperature and then cover with plastic wrap and refrigerate overnight. Use a biscuit cutter to cut out the grit cakes. I used a 2 1/2-inch cutter for mine but I will experiment with smaller ones in the future for appetizers. My grit cakes had no standing moisture but if yours to make sure to gently absorb it with paper towels. Heat a saute pan over medium heat. When hot, add 1-2 tablespoons olive oil. Add the grit cakes and cook for 4 minutes on the first side and 3 1/2 minutes on the second side. Serve with cilantro cream and a generous sprinkle of chopped cilantro. Pull off a big pinch of cilantro and chop it for garnish. Put all ingredients in a food processor and blend until you have a bright green sauce. Taste and adjust the salt and pepper to taste. Refrigerate. Serve with cilantro cakes. I love a seafood salad. Sometimes you get more filler than you do seafood, so I no longer order it when I dine out, as I would much rather make it to my liking at home. When Marx Foods sent us dill pollen, I knew what I was going to make. Dill is an integral part of a seafood salad, but the pollen made it exceptional. What a difference it made! It gave the salad a crisp, clean flavor, stronger than regular dill, yet with a lighter taste to it. The measurements below are for my perfect salad. You may want to adjust the seasoning to your own taste. Just remember to let the salad chill for a little while before making any additions -- the longer you let the flavors mingle, the stronger they become. As with any salad, make your dressing in a separate bowl so you don't overmix the seafood -- you want that crab and shrimp to stay as intact as possible. Feel free to change up the ingredients as you see fit but my advice is don't skip the dill or dill pollen! adapted from all the seafood salads I have EVER eaten! Shell the crab and refrigerate until needed. Place the shrimp in a bowl, sprinkle a little freshly squeezed lemon juice over them and put them in the fridge. Combine all ingredients. I usually don't add any salt, it's totally optional with all the other flavors. If you have to have pepper, I suggest that you use white pepper. I personally don't like to see little black specks floating around in a creamy dressing. Mix well and chill for about an hour. Taste and adjust seasoning to your liking. Chill. In a bowl, mix the celery and green onions. Add the dressing, mix well. Add the shrimp and mix gently. FOLD in the crab. Done! You can plate the salad on a bed of lettuce, stuff it into a beautiful homegrown tomato, or even into an avocado half. Garnish with a little curly parsley and some lemon wedges. Note: I chose to marinate the tilapia in some olive oil, white wine and salt and pepper for about 12 hours but you may skip this step if you don’t have time. Dice the reconstituted mushrooms. Melt 1 tablespoon of butter in a sauté pan over medium heat. Add the mushrooms and cook for about 5 minutes, until browned, Add the shallots and cook for about 2-3 minutes, until translucent. Add the wine and stir till evaporated, season with salt and pepper. Add the cream and saffron threads, and simmer for about 10 minutes, till the mixture is reduced and thickened. Set the heat to low and keep warm while you cook the fish. In another saute pan, melt 1 tablespoon of butter and ½ tablespoon of olive oil over medium -- medium-high heat. Add the fish. Saute for about 4 minutes per side, flip carefully. 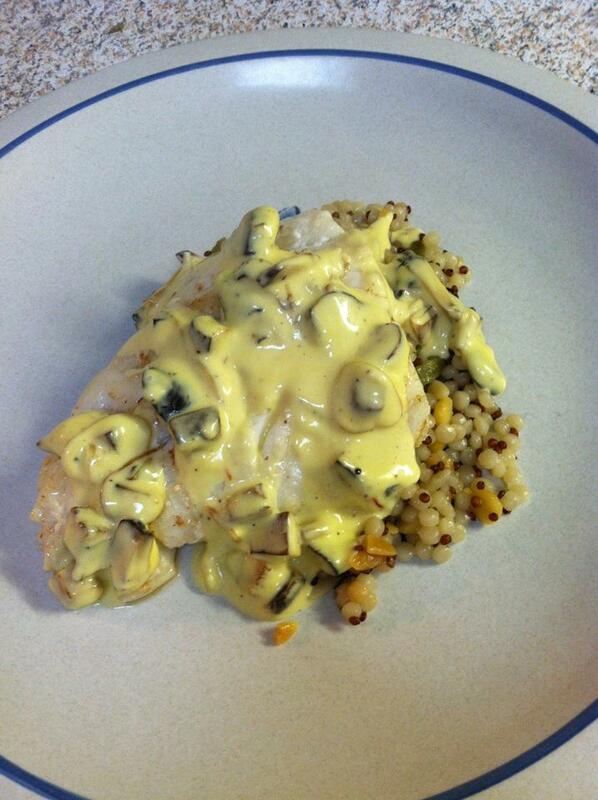 Place the cooked fish filet over rice or other grain (see below), spoon the cream sauce on top and serve. *I served the fish over Trader Joe’s Harvest Grains blend of Israeli couscous, red and green orzo, split dried garbanzo beans and red quinoa but any grain will do. A green vegetable or a salad will add some nice color the dish needs.